#SKETCH50 is 50 days full of inspiration to build your visual vocabulary and help you find success in visual note-taking. This year’s 3.0 version is taking a different approach than past years. We are providing you with the #Sketch50 3.0 Icon Grid. The grid is made up of SEVEN rows and SEVEN columns. Of the 49 squares on the grid, we are providing prompts 42 prompts. The remaining 7 squares are the sketcher’s choice of icon. We have even provided a place on the grid for you to draw your face as well as where you are from. You can sketch with pencil/pen/paper or digitally with a tablet device, it’s your choice! Do whatever is comfortable for you. As you finish rows and/or columns, consider sharing your work on social media. If you are an analog sketcher, take a picture and share on social media using the hashtag #SKETCH50. If you’re a digital sketcher, you upload into the social media platform of your choice from your device. Don’t forget to tag with #Sketch50! 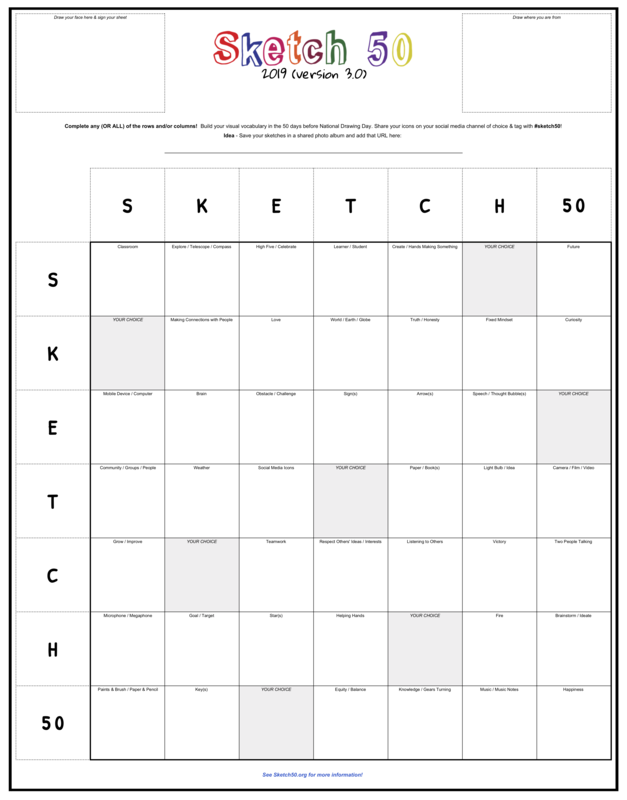 If you are a teacher using #Sketch50 with your students (and your school allows it), we would love to see the grids of your students. Do you HAVE TO share? Nope! Share what you are comfortable with. It is about the process not making something pretty. We all have to model letting go of judgment and putting our work out there. Especially as educators, the more you model your process for students the more likely you will see students leaning into sketchnotes themselves. #Sketch50 3.0 will begin on Wednesday, March 27, 2019. We are excited to see the community share their sketches of 50 icons over the 50 days leading up to National Drawing Day. Check Sketch50.org on March 27 to download our #Sketch50 3.0 Icon Grid.